Restaurants – Page 2 – A TAVOLA ! Last week end my wife invited me for a journey in Colonia del sacramento, just on the other side of the Rio de la plata when in Buenos Aires. Best to go there is by express boat from Buquebus whom terminal in Buenos Aires is located in Puerto Madero’s harbour. After no more then 45mn to an hour of cruise you will reach this small colonial town which was registered in 1995 by UNESCO as a world heritage site. Colonia was discovered and settled by the Portuguese in 1680 before to be disputed by the Spanish. During more then a century it kept changing hands through terrible battles and treaties between the Portuguese and the Spanish. It even belonged to Brazil twice as was the North of uruguay. When in Colonia, there is not much to do but spending your time walking through the preserved old town ( better known as “el casco historico” ). We found it so beautiful that we could hardly stop taking pictures during those 2 days. The visit of Colonia is proposed now by many tour operators when in BA. And many “portenos” are spending their weekend there during the spring and summer time. Go there during the week if at all possible. Be aware that many of Colonia’s old town restaurants are tourist traps and will serve very average quality and charge a premium price. “El drugstore” for lunch to enjoy an excellent “Chivito“. 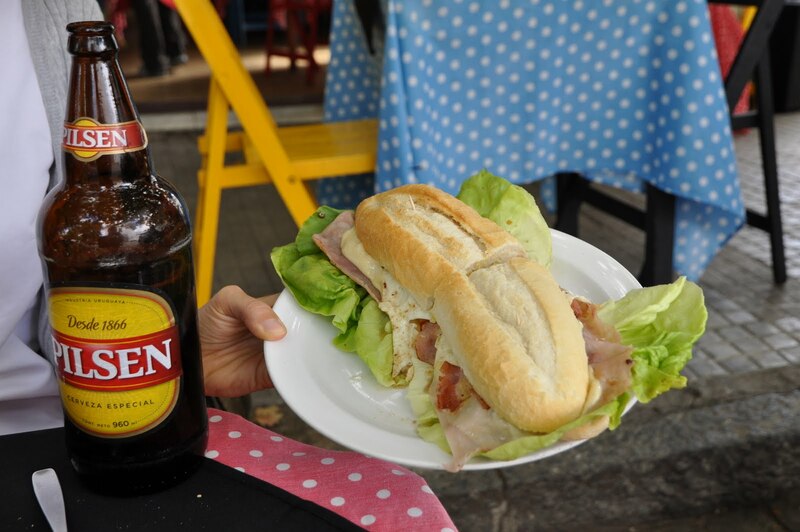 Uruguay national sandwich. Together with a Pilsen beer. Uruguay national sandwich. Budget 15USD per head. “Lentas maravillas” in the afternoon. Colonia’s best kept secret. Santa rita 61. Excellent tea collection, home made pastries, great garden and delicious argentinian owner maggie. 10 USD. “La bodeguita” at night where you will find excellent home made and fresh pasta. Very good pizza as well as delicious “postres”. More importantly it offers a sea side terrace. Perfect for sunset. 15USD. 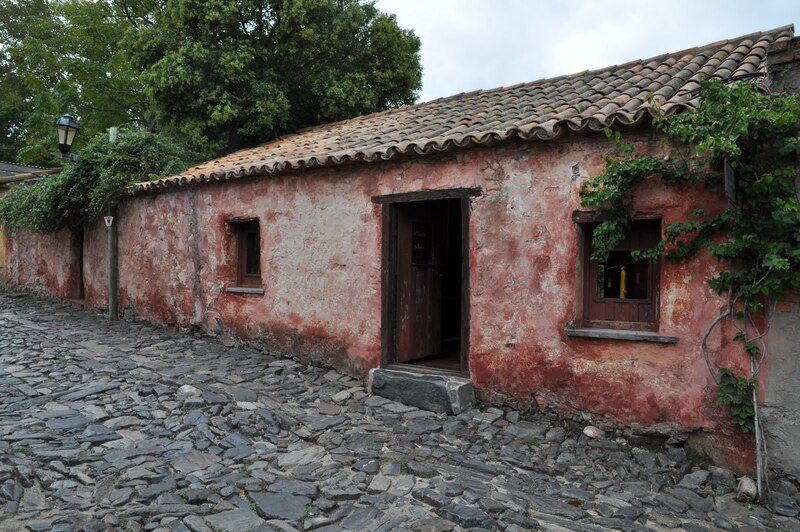 Colonia is absolutely worth a day or 2 during your trip to Uruguay or Argentina. Leave your blackberries and iPhone home, and just accept to switch off your mind. Hasta pronto mi querida Colonia ! Today we had our second time at the peruvian “Astrid y Gaston” restaurant. The first time was very good. That one was just “Ottimo” ! As “pisco” is the national peruvian alcohol, you need to taste one of the 30 or 40 pisco based cocktails. This will likely pave the way for a great moment. 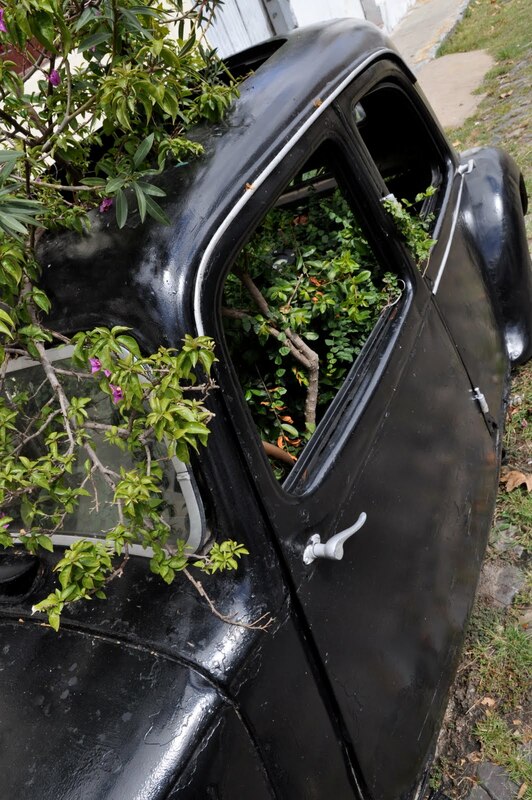 At “art de vivre” we are used to talk about what we know and what we experience. 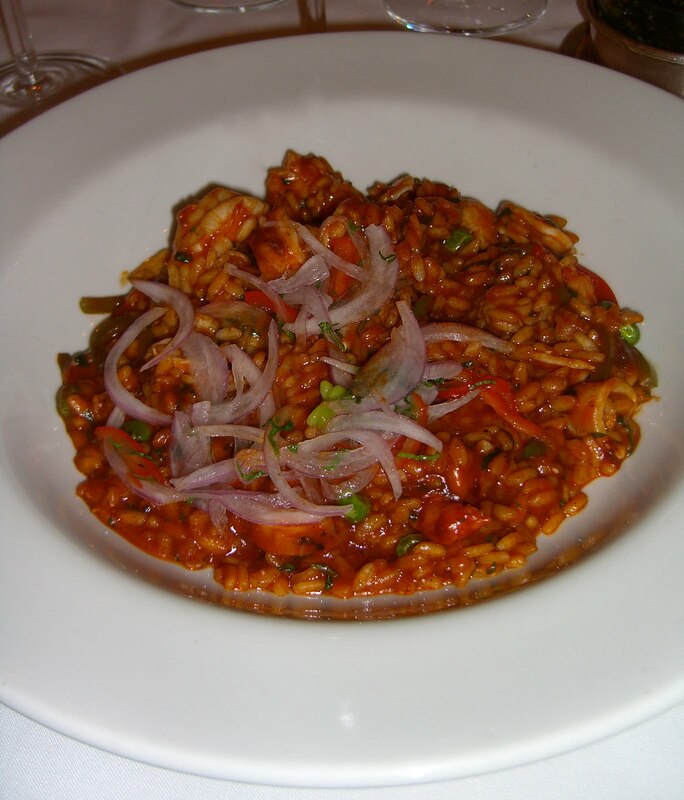 To start with we would recommend you one of the many ceviche ( marinated fresh frish ). The pink salmon is especially incredibly fresh and very tasty. This is what i personally had and ate ! All the other fishes are of prime quality as well. Then without a doubt i’d orient you to carry on with “Arroz de mariscos”. The rice came cooked as a risotto melt with pieces of shrimps, calamari and scallops. With no exageration, the sea food was simply the best i’ve ever had. My wife had the white salmon. Perfectly cooked. 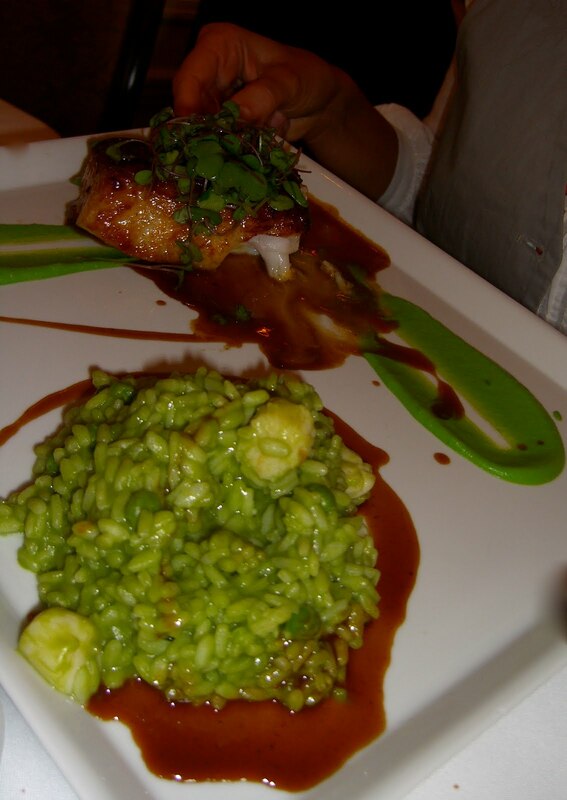 Also proposed with a pea risotto. Picture below. The wine list is exhaustive. We had some per the glass at around 20 ARS or 5 USD. 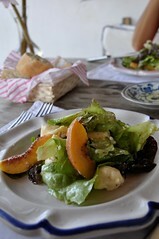 Please NOTE that currently the restaurant is offering a 3 courses lunch menu for around 90 ARS ( 20 USD ). Which in my opinion is an excellent quality/price ratio for BA. On average count on 150 ARS ( 35 USD ) per head with wine, water and coffee. Astrid y Gaston : Lafinur 3222, Capital Federal. Buenos Aires. Buenos Aires is a vibrant big city. More then 3 Million people are living in the very heart of BA, called Federal district. But more then 13 million in total are living in the agglomeration. While i am sure you will very much enjoy BA, this city will likely drive you crazy after a couple of days. Intense trafic, noise, pollution… All the little pleasures of a LATAM metropolis ! 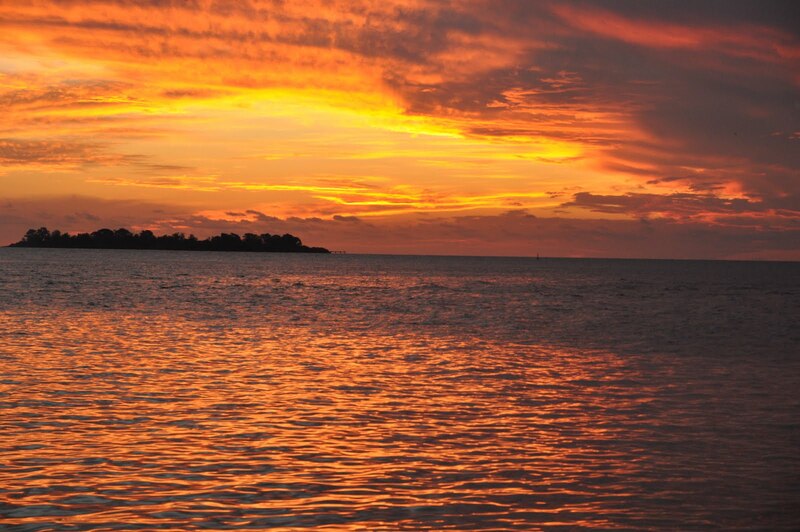 One great way to survive and take some fresh air is to go and discover the Rio de la Plata. Take the train from BA retiro station ( 40 mn ) and go down at Tigre “estacion”. It’s green and very cheap. 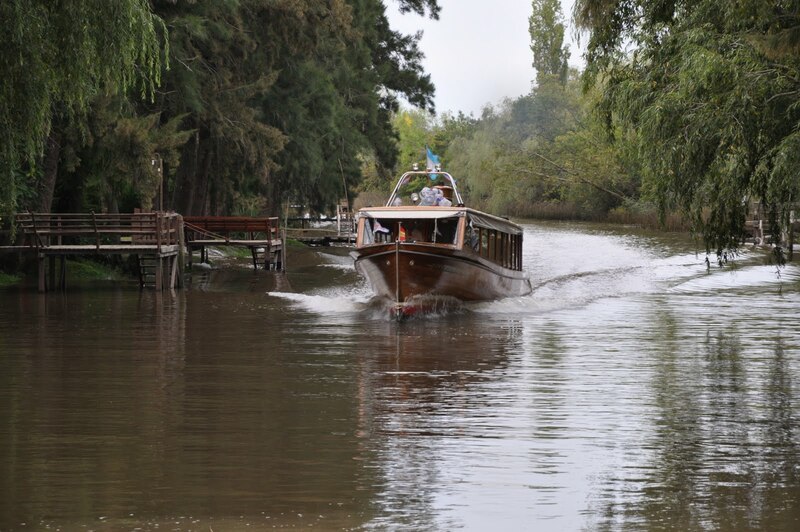 Walking distance from the Tigre station you will find the harbor from which all shuttles leave to the Delta. We strongly recommend the “Interislenas” company which is usually departing from ramp 1. Roundtrip ticket will cost you 17 pesos or 4USD. 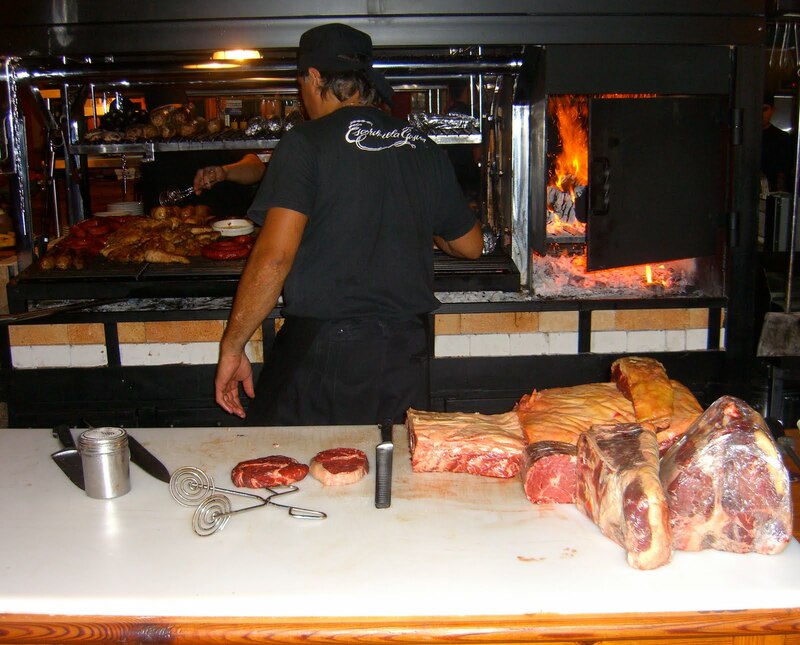 Ask the driver to drop you at the restaurant “El Borazo” where you will enjoy the best meat in the area. The “bife de lomo” and “bife de chorizo” are simply a great moment ! 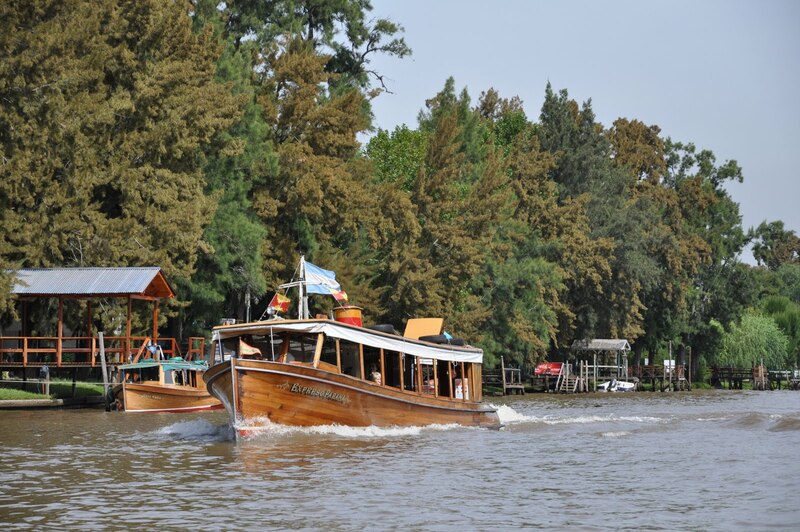 The trip to el Borazo will last around 1H, during which you will be able to discover the magnificence of the Tigre. Be aware. Last shuttle back ( above picture ) to Tigre estacion will leave from the restaurant at 6PM local time. Or you could well decide to spend a night in the Delta. Several boutique hotels will welcome you. One of those we know is “Rumbo 90 lodge” where you will be able to relax and discover the charms of the river at night. 2 days ago we wanted to have a real “Parilla” close to where we live, in the Belgrano district of Buenos Aires. And we’ve had it ! “Parilla” means BBQ. In Argentina or Uruguay, this is how they usually cook the meat, fish, cheese ( provoleta ) or even the vegetables. El Pobre luis is an Uruguyan restaurant, managed by Luis Acuna for many many years. Most of the staff is from Uruguay. The service is “impeccable” which will instantly make you happy. 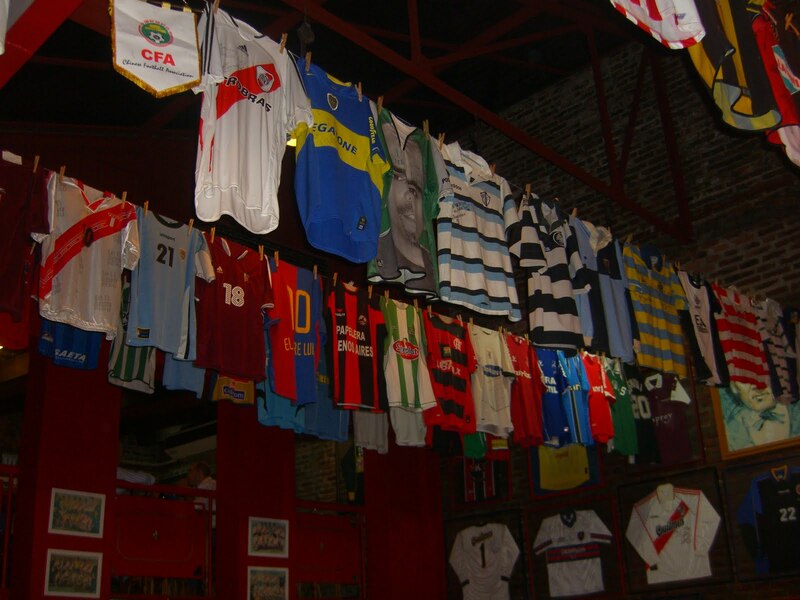 The place is pittoresque and full of football shirts as Luis is a soccer fanatic. The atmosphere is very friendly and family oriented. All generations are represented. We’ve ordered an excellent provoleta to start with. And obviously meat to follow : one “bife de chorizo” for my wife, “costilla de lomo” for me. Both very tasteful and tender. Count approximately 50 to 60 AR$ ( or 12 to 15 USD ) for any piece of meat you’d like to order. Wine was a bit expensive so we’ve decided to order a 10 USD bottle of Familia Gascon from Bodega Escorihuela Gascon. Rather sweet, round and well on the fruit. All in all we’ve eaten for 100 AR$ or 25 USD each. This is not cheap for Buenos Aires. But we’ve had a great moment and food. So worth once in a while. In the next couple of weeks, one of our missions will be to find unkown and kept secret “Parillas” where to eat excellent meat for half that price. So stay tuned ! “El Franchute” means “Le Français” and is a restaurant 10KM away from both José Ignacio and Punta del Este. 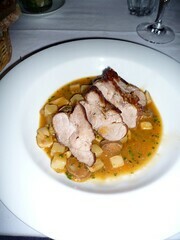 The chef Laurent Lainé is French and has been working in Argentina and uruguay since 1983. He had his own restaurant “Bleu, Blanc, Rouge ” for years in Buenos Aires and also worked in the very best ones bringing him a solid reputation in the area. He recently decided to leave Argentina and start El Franchute, what he calls a “table d’hôtes”. Actually the very first one in Uruguay. A day we were driving through the area, we’ve decided to step by his place. It was around 7pm. As we were entering the restaurant, we were immediately welcomed by Laurent lainé in person. He was actually busy preparing the 7 courses fixed daily menu ( 45 USD ) together with his reduced staff, but took some time to have a good chat with us. He appeared to be very friendly and passionate person. Unfortunately that evening we had another commitment. Soon we’ll go back and let you have a detailed dining experience. But the good vibes we’ve felt visiting the place were already enough to drop you a note and encourage the experience. That was the main dish i had. 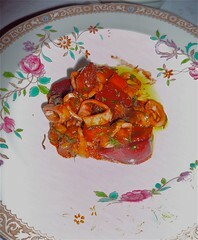 Slices of delicious lamb served with a mix of chorizo and calamari and their sauce. Audacious but very sucessfull mix ! That’s another good lesson. Never be afraid of mixing flavours, ingredients that might appear not to be really compatible on the paper. Think wild ! “Isla de flores” is a summer restaurant managed by the same team and chef then “Isla de flores 1900” in Montevideo which is their main adress during the rest of the year. 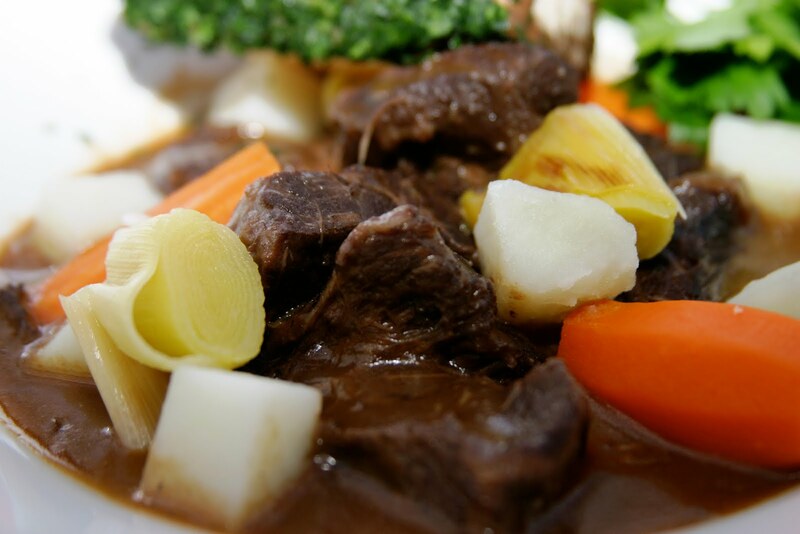 Within a very friendly and relaxed atmosphere you will enjoy raffinated and fresh cuisine. Both meat and sea food lovers will find their way to a great moment. The staff is on top of everything. Excellent dessert with a cooked and caramelized pear served with Mascarpone ice cream. Very good and affordable wine list as well. Budget around 50 USD / person.